Ah, the Single Wing! Love it or hate it, the Single Wing offense works perfectly in youth football. Like football from yesteryear, youth football is all about running the football. The Single Wing offense is tailored to power run the football over youth football defenses. The Single Wing offense puts more blockers at the point of attack than any other offense and overpowers the defense. And the Single Wing Sweep is all about bringing the house on the sweep. 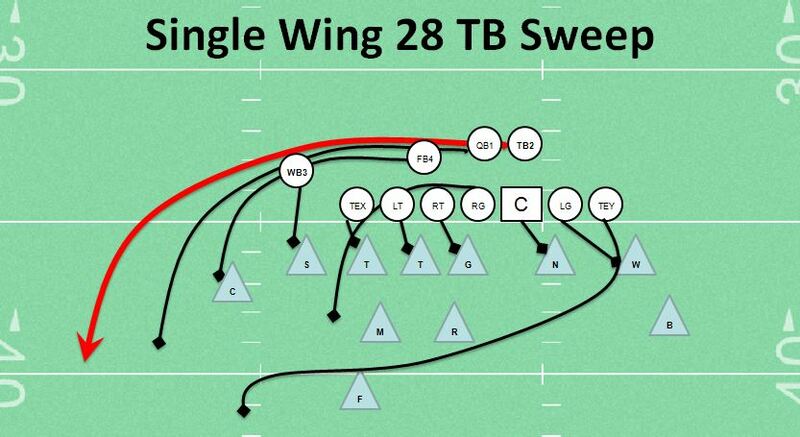 Which is why the Single Wing Sweep is number 7 on my top offensive plays in youth football. Many probably have seen a form of this play in the NFL and the pros call this formation the Wildcat. The Single Wing Sweep starts with a direct snap to the TB that is standing next to the QB. The TB sweeps to the right staying behind his wall of blockers and climbing the stairs to the sideline and end zone. The QB and FB sweep and block the corner and any linebacker flowing to the sweep. The Wing Back blocks the defensive end or outside LB and sets up the sweep walling off the contain man. The offensive line severe angle blocks down or left and the playside guard if uncovered pulls to help pick up flowing LBs. The backside TE chips the DE and flows to the safety for down field blocks. If the defense is prepared for the sweep by a wide corner or de, then have your running backs block them to the outside and the TB should cut underneath their blocks. This adjustment is very much like the old Lombardi stretch sweep play. Youth coaches should love the Single Wing offense or its variation THE BEAST. Most youth football coaches think they need to run the Spread offense and throw the football to prepare their players for High School football. Because your pass completion rate is typically below 25% in youth football, a pass play is usually a wasted play. As a defensive coordinator in youth football, I love to coach against a passing team, because I know they are going to waste a ton of plays preparing for the future and I am coaching to win this game not my son’s high school game in five years. Although the Single Wing offense is set up to run, you can always throw in a Tight End Pop Pass and Wing Fly. These plays are very effective, especially the TE pop pass. Usually the defense has put 9 or 10 in the box against the Single Wing and a TE pass usually results in a long gainer, plus it has a very high completion rate. So what do you think about the Single Wing Sweep or Wildcat? Let me know if you love it or hate it. Would love to hear from you. Please leave me a comment below. Hello coach. Just checking to see when you may update your top 10 plays list. just made an update. sorry for the delay. Thanks for reading my blog.